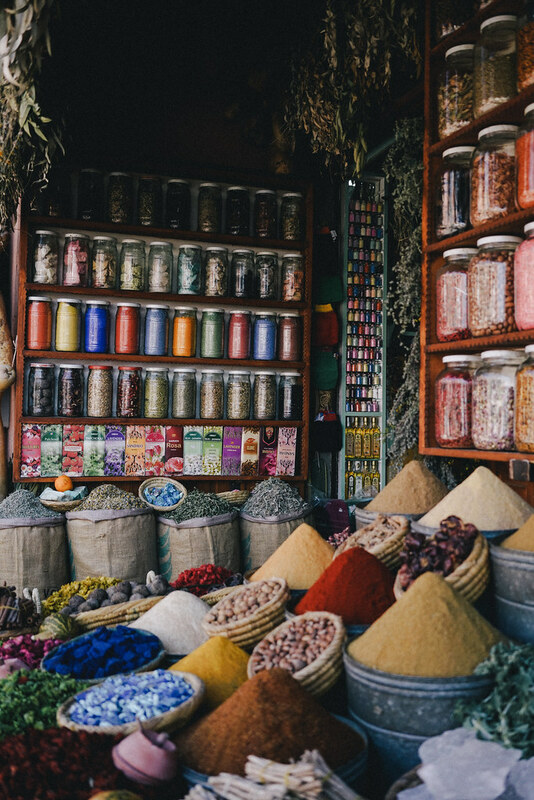 Marrakech is a destination that has always felt like a far-flung, exotic getaway. Living in Los Angeles, this North African trade town has always felt worlds away, that is, until a friend revealed that my dream destination was only a 3 hour flight from Paris Charles De Gaulle. When I realized I had two weeks off after Fashion Week, I seized the chance to escape the last leg of European winter for a few days of sun. The first few hours was a surge of senses. Upon landing, you’re greeted by a wash of sun and dry, desert heat. The drive into the Medina was a scene filled with warm pink walls, mystifying alleyways, and ornate, Arabic tilework. You’re welcomed by a flood of fragrances the moment you walk along the city center. 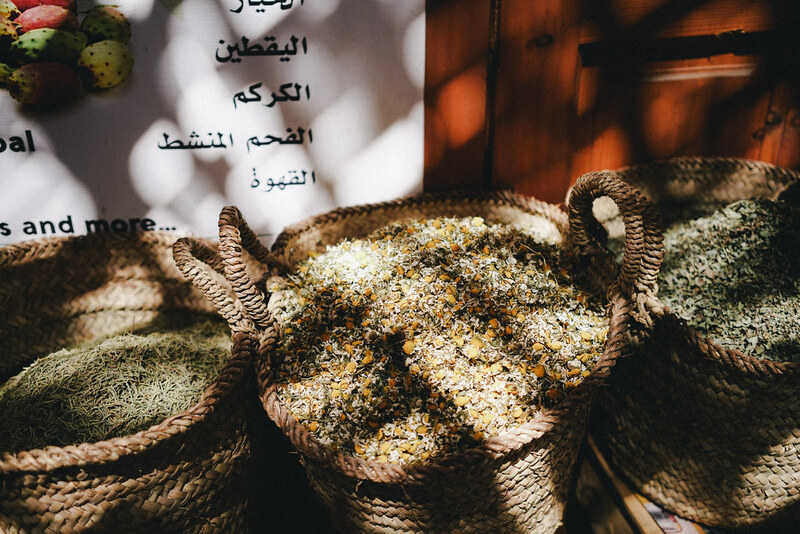 First, there were the lingering spices at the Souk, followed by the flowering buds of Fleur d’Oranges passing through a jardin. Immediately I felt that the best thing about Marrakech is that the sheer presence of being there is an escape hatch from anywhere else. I spent a total of 9 days in Morocco, 5 in the Medina and another 4 in the countryside. You can get a strong feel for the city in a 4-day trip. If I had to re-do it all again, I would spend only 2 days in the village outskirts. Here’s a breakdown of what you need to know below. Arabic and French. Most of the vendors are fluent in English. In spring or fall, when the desert temperatures are mild. There are two ways to approach hospitality in Marrakech. There are palatial grounds like La Mamounia and Royal Mansour Marrakech, both former palaces that offer service fit for a king. Then there is the Riad-converted boutique hotel, which provide a more intimate setting. Riads are traditional homes in Morocco containing an inner courtyard and garden. 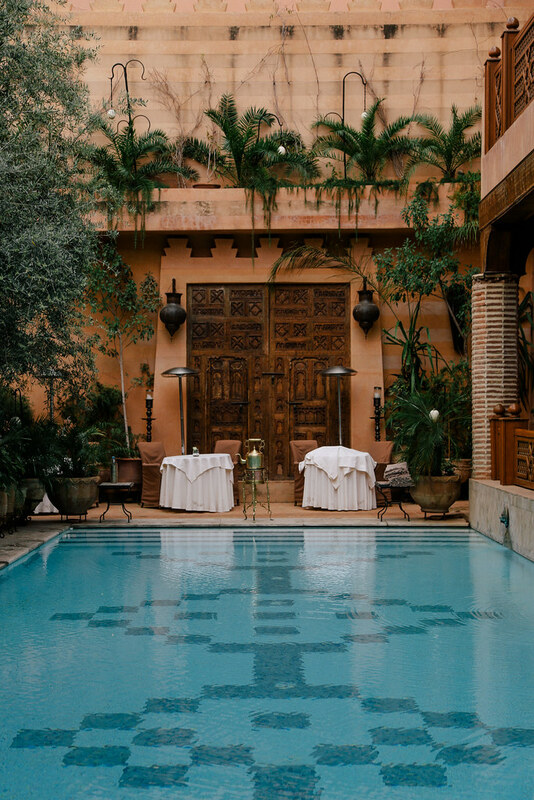 Properties like La Mamounia are so luxuriously designed there’s almost no desire to leave the hotel, which has its own manicured gardens, restaurants, bars and hammam packed with Instagram-worthy moments. If the aim of your holiday is to relax, then splurging on a 5-star property is the perfect way to experience Marrakech. 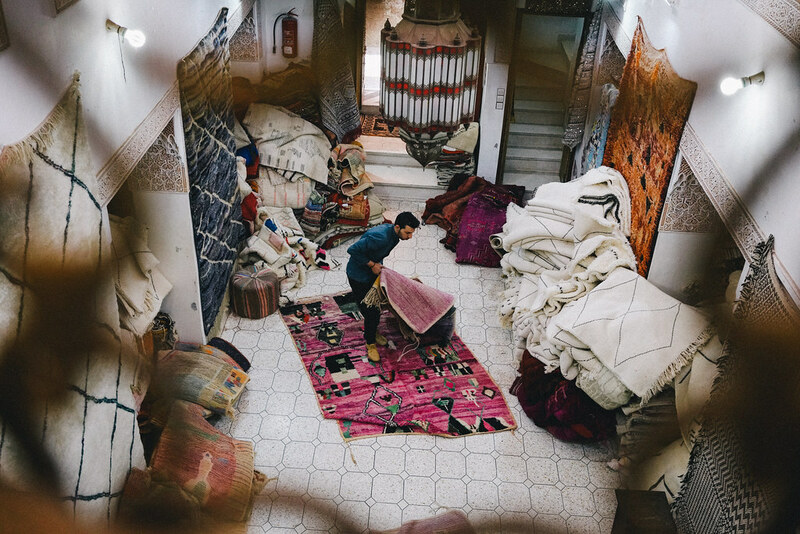 If you’re looking for more of an adventure, the Riads are located in the heart of the Medina and offers an experience that puts you at the pulse of the city. The first rule to dressing in Morocco is respecting the cultural emphasis on modesty. While Marrakech is dominantly Muslim, the heavy influx of tourism does permit for a more open-minded dress code. It is polite to leave your club clothing behind, but you are not completely restricted to maxi dresses and kaftans. You’ll find that most travelers get by wearing shorts and mid-length dresses. Coverage completely depends on your comfort level. At the souks, sellers are on the look-out for tourists, and wearing revealing clothing can draw unnecessary attention. You won’t find many women working at the souks, so wearing revealing clothing may solicit unwanted cat calling from male vendors. The Old Medina is more conservative in terms of dress code. 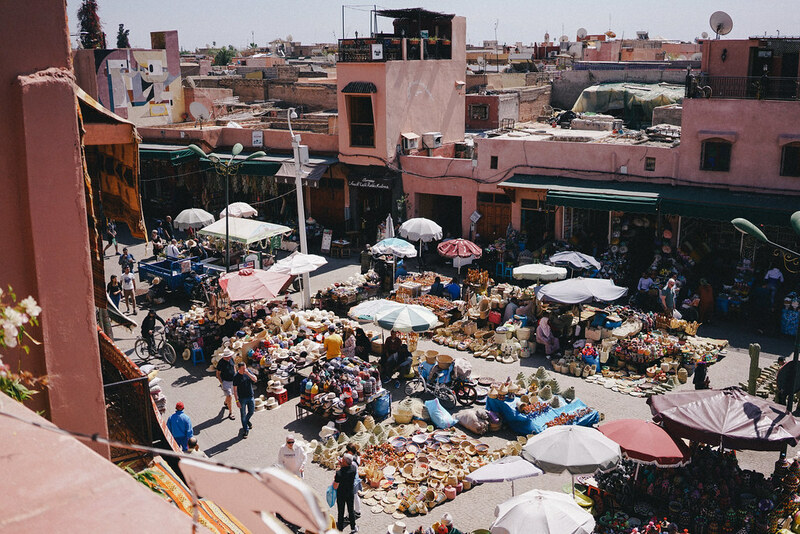 Moroccan women in the Old Town are traditionally covered in a burqa, while in Gueliz, the modern neighborhood of Marrakech, you’ll find that women are dressed more casually by Western standards – a well-styled hijab mixed with blue jeans and a blazer. 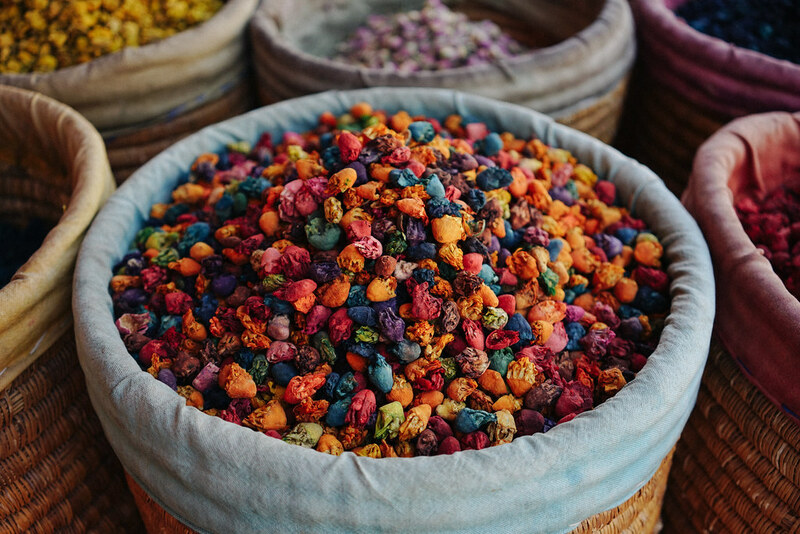 Start with a breakfast at the hotel or riad, followed by a morning of shopping the souks. Lunch is best served on a sunny terrace at Places des Epices overlooking the square. In high afternoon, schedule a service at a local hammam. After a refresh, the afternoon is best spent cooling off with a cold beverage inside a jardin. 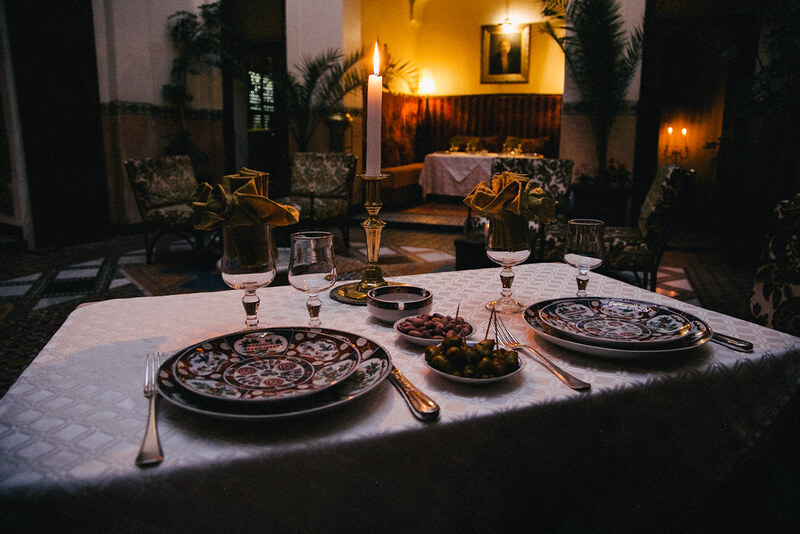 Evenings are the perfect opportunity to absorb the romantic atmospheres of dinner venues like Ksar Essaoussan or Dar Cherifa. If you’re looking for energy with a bit of atmosphere afterwards, you can find a good night cap at Le Bar Churchhill at La Mamounia. When it comes to the souks, I would recommend doing a walk through before initiating transaction driven from sheer sensory overload. 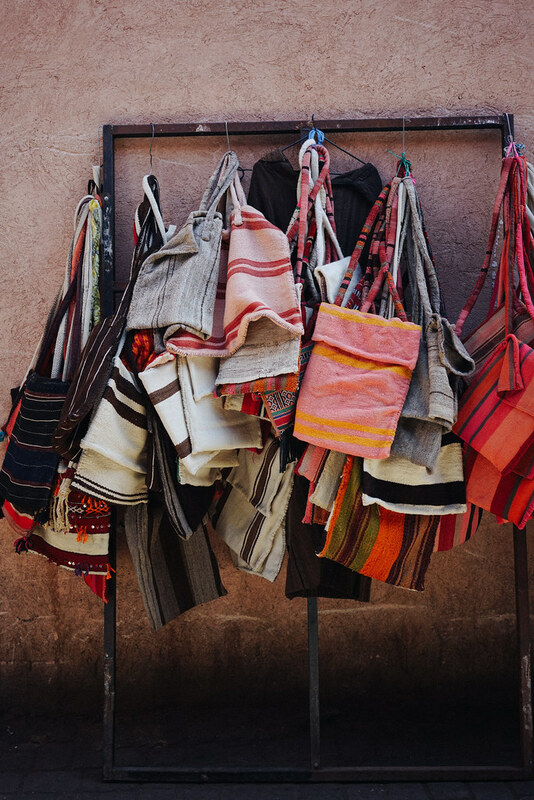 Once you get a feel for the different shops and merchandise, you start to notice that many of the stalls carry identical inventory, especially when it comes to babouches, Turkish towels, and Moroccan argan oil. 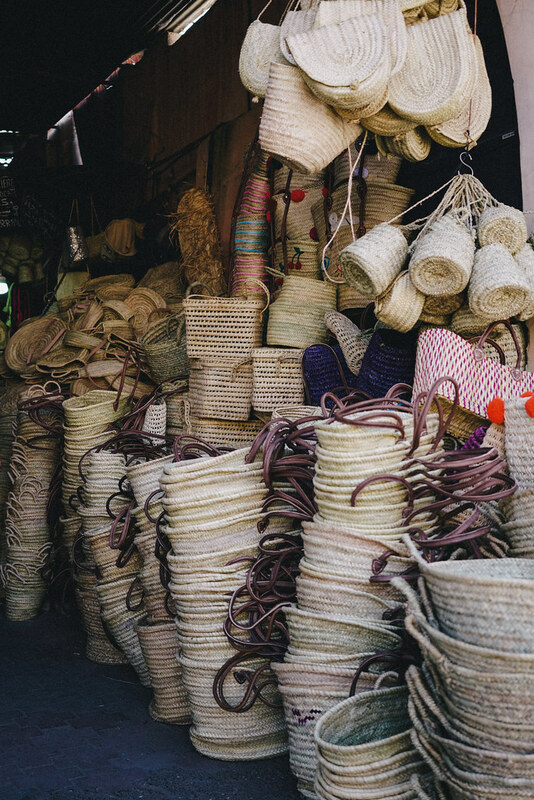 There is certainly no shortage of local products for purchase at the Souk, but I found that there were a lot of inauthentic objects mixed into the inventory, spotting items I’ve found in other high-volume market places in Bali and Mexico. For one instance, I spotted a shop keeper unloading a box from China in one of the stalls. There were some objects like pottery that are claimed to be “Made in Morocco”, but I would be skeptical about purchasing pottery unless it’s sourced from a studio. Well-priced, and locally sourced objects were glassware, babouches, rugs, and herbs. I stopped at Lahandira to buy a carpet and Tresor de Nomades for Moroccan trinkets. I bought baskets in Places Des Epices, an outdoor market packed with vendors laying out all sorts of souvenirs, including baskets in all shapes and sizes. For fragrance, I visited Herboriste du Paradis. This is one city where you negotiate the price of everything – for cab fare, for spices, for babouches, for rugs, you name it. My advice is to not get swept into the heat of a transaction – don’t be afraid to walk away if you feel that the price is not fair. Several shops offer the same product, so if one shop keeper is too aggressive, you can always visit another one. In one instance, I haggled too low with a vendor, visited other neighboring shops, only to realize that the original vendor had the best price. In short: You can always return to the shop keeper who has the best deal. Any place within the medina walls should not cost you more than 30 MAD (3 US dollars) during the day. At night, the taxi drivers surge their prices and may use bartering tricks like adding an additional charge for traveling with a companion. Haggle on what you feel is fair for the price, and again, if someone is being too aggressive – move on and try to hail the taxi right after. 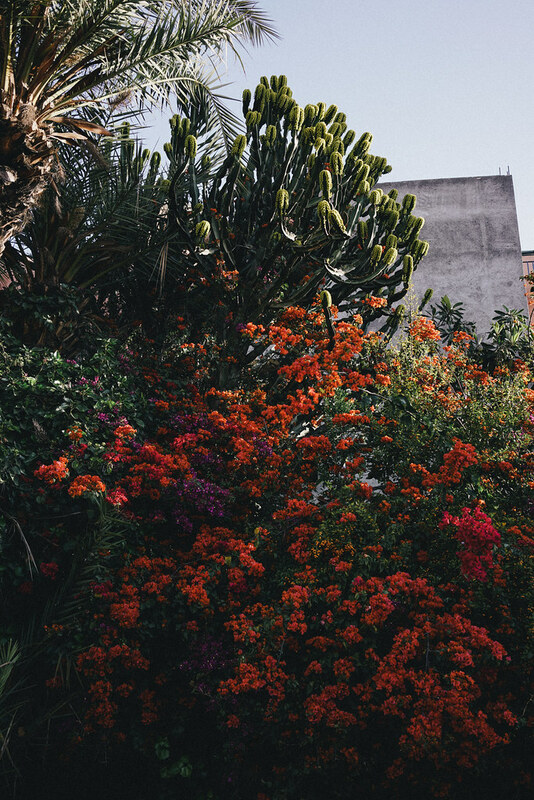 One of the most stunning features of Marrakech is the landscape, and fortunately, there’s no shortage of Jardins you can visit to admire the local flora. One of the flowers I grew especially fond of on the trip was Fleurs D’Oranges, a special hybrid of an orange blossom that grows in abundance throughout the city. It was my favorite souvenir and memory of the city: I found notes of it in almond milk, cakes, bath oil, and room diffusers. La Mamounia’s Garden – Stroll through the pavilion and grab an ice cream at the end of the garden. Jardin Majorelle – get there early or end of the day when the crowds have died down. Le Jardin Secret – for the views and tucked-away atmosphere. Growing up in a diverse city like Los Angeles, my tastebuds have developed a flavor for things rich and complex in flavors, something that tends to run opposite of a delicate French palette. So eating in Morocco was a dream come true: The local cuisine is layered, aromatic and complex. I loved every meal. I dove into caramelized chicken tagine with couscous, washed down with a serving of Moroccan mint tea sweetened and soaked with fresh mint leaves. 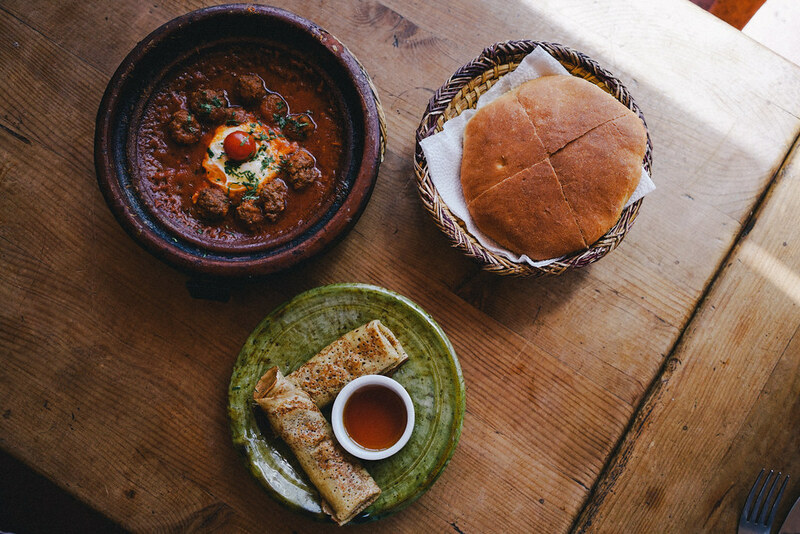 For larger appetites, I recommend the spicy meatball keftas with a fresh loaf of khob, the Moroccan flat bread that effortlessly pairs with every dish. My highlight was the desserts, the only food category I lean lighter on flavor: In Marrakech you can find crumbled almond cookies, shortbread, and cornes de gazelles. For traditional fare, head to Café Arabe, Cafe des Epices or Akkal. For lunch, I loved the outdoor terrace of La Famille. There’s also Kechmara, La Terrace des Epices, and Grand Cafe de la Poste. For dinner, the top contenders are Dar Cherifa, Ksar Essaoussan, La Maison Arabe. For something more modern, head to Plus 61, Nomad, Max and Jan who serve fusion and also non-Moroccan dishes. There isn’t a strong cocktail culture in Marrakech, however, finding a drink is not impossible. Most restaurants serve a wine list over dinner, a local speciality being Moroccan vin gris, but if you’re looking to grab a cocktail, head towards a hotel bar, who can fix you up a drink with liquor and its accouterments. Marrakech is home to a splendor of architectural landmarks. Heritage sites like Medersa Ben Youssef and Bahia Palace are open to the public to showcase the country’s longstanding history with artistry and craftsmanship. 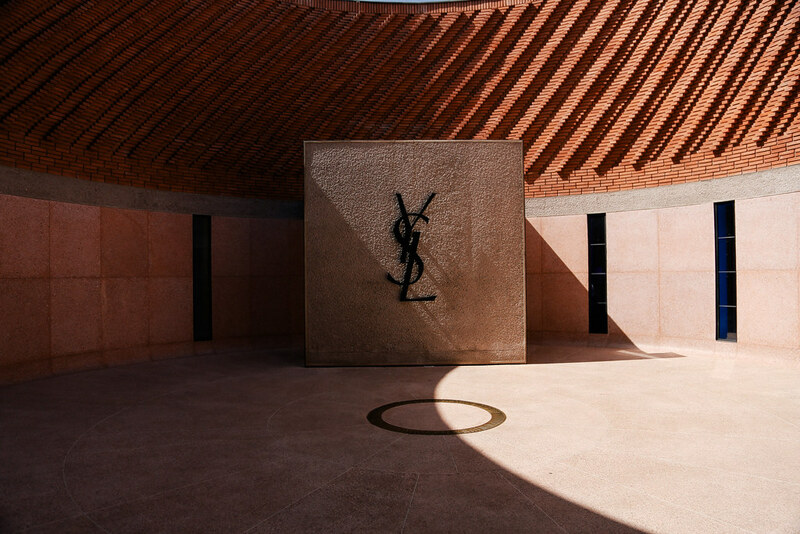 The Musee YSL is also an incredible showcase of Yves Saint Laurent’s love for his expatriate home, and also an outstanding exhibition of his work.